The England international’s stand-off with Liverpool is reported to have put clubs including Arsenal and Manchester City on alert. 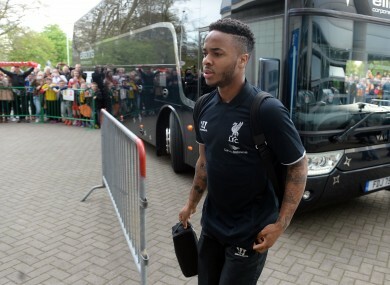 Sterling and his agent have come under criticism for their behaviour of late. THE AGENT OF Liverpool forward Raheem Sterling said on Tuesday that media reports his client will ask to leave the club have been “blown somewhat out of proportion”. The sports pages of Britain’s newspapers were dominated by the story that Sterling, 20, will inform Liverpool’s hierarchy of his desire to leave during a meeting with club officials on Friday. Sterling has already admitted turning down a new contract worth around £100,000 ($155,500, 139,000 euros) per week, but his representative Aidy Ward says they will approach the talks with an open mind. “The story has been blown somewhat out of proportion,” Ward said in a statement sent to talkSPORT radio. Sterling has two years left on his current deal, thought to be worth £35,000 a week, and told the BBC last month that he was putting negotiations over a new contract on hold until the end of the season. The England international’s stand-off with Liverpool, who signed him from Queens Park Rangers in 2010, is reported to have put clubs including Arsenal and Manchester City on alert. But Arsenal manager Arsene Wenger was coy when asked if was interested in signing Sterling during a press conference on Tuesday. “I don’t like to lie. If I say I will and I don’t do it, you will say I lied,” said the Frenchman, who made an unsuccessful attempt to prise Luis Suarez away from Anfield in 2013. Email “Looks like Raheem Sterling may NOT be leaving Liverpool after all”. Feedback on “Looks like Raheem Sterling may NOT be leaving Liverpool after all”.